That was the reaction I got a few weeks prior to our vacation at a waterpark, when I mentioned the wave pool to my seven-year old, Joey. He went on and on, adamant that he wouldn’t set foot anywhere near it. Then came vacation, and Joey found himself face-to-face with the 600,000-gallon wave pool, filled to the brim with happy kids. The waves were crazy at times. Joey got swept under more than once and drank about a gallon of pool water in the process. But each time the waves came, his father stood behind him, keeping a close eye, ready to scoop him up at the first sign of trouble. Joey would sneak a peek over his shoulder every now and then, just to make sure that his daddy was still watching him. And of course, he was. Before that first visit was over (the first of many), Joey learned to love the waves, and it wasn’t long before he was diving face-first into each surge, giggling, beaming with joy, and running back for more. In Isaiah 43, God is urging His people to learn to love the waves, because God will once again prove Himself to them in those troubled waters (Verse 2). This particular chapter contains prophecy for the southern Kingdom of Judah. Because of their rebellion, destruction was coming in the form of the Babylonian Empire and a 70-year exile (Verses 14-18). But because of the longsuffering love of God, restoration would come after the 70 years had passed (Verses 4-7, 19-21, 25-26). And the point of this exercise? It’s all laid out in Verses 10-13, and it’s not about punishment – it’s about proving the power and the rightful place of God. God’s people had given their hearts to false gods. They had staked their families, their homes, and their very existence on the protection and provision of gods that they themselves had made. They had violated God’s laws while continuing to reap God’s benefits, God will have no more of it. He will prove Himself, and they will soon see that their idols have no power at all. Their idols won’t save them from invasion. Their idols won’t bring them home from exile. And their false gods will be powerless to rebuild and restore the brokenness and devastation. In the end, God will prove to be their only Redeemer – just as He proved himself at the Red Sea, and just as He would one day prove on the cross (Psalm 124, Romans 5:8. Colossians 1:12-14). And though God will allow them to pass through these waters of adversity, He will not leave them to face the waves alone. Because unlike the man-made gods that they have foolishly followed, the One True God is personally invested in their future. He is their Sovereign Creator, their Kinsman Redeemer, and their only Savior (Isaiah 43:1, 14-15). Those waves, with all their roaring, crashing, and bashing, are really just handfuls of water, thrown into their lives by a loving God Who calls them to wake, rise up, and return to Him (Job 5:17, Psalm 94:12, Acts 3:19-21). In the end, those waves will serve the purpose of the God Who made them, and they will still instantly at the sound of His voice. My advice to you: Learn to love the waves. For when God chooses to let them rise, He promises to walk you through them, to preserve you, to sustain you, and to hold you up with His righteous right hand (Isaiah 41:10, 13). And when those waves finally recede, you will know that only God kept you safe, gave you His strength, and never left your side. Yes, learn to love the waves. Your enemy wants you to believe that they will break you. But your Father will use them to make you more like Him (Isaiah 55:10-13, Romans 8:28-29, II Corinthians 3:17-18, 4:8-9, I Peter 5:8-9). So pray for a miracle, pray for deliverance, and renewal and restoration, but in the end, praise Him for the work that He does in the waves. Are you walking through rough waters right now? 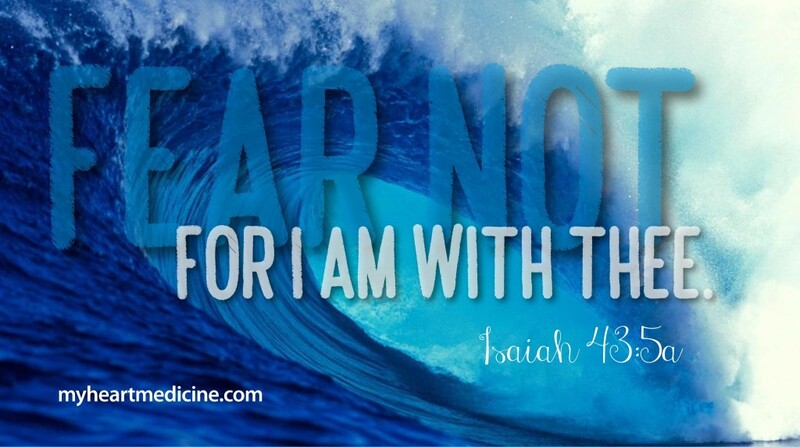 God is there with you. And while He may not still the storm in your timing, He will carry you through that storm. Ask Him to show you what He’s doing in you, so that you can learn to love the waves. Once again you have hit it spot on!! My land has just flooded & I have lost a lot! But through it all I know God is with me, He has a plan for me!